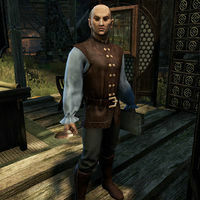 Obenion is a Bosmer moneylender who runs Thieves' Trove Finances in the Outlaws Refuge in Vivec City. "Worried about the locals? I honestly can't tell you of a safer spot. There's somewhat of an unspoken code down here." "Once worked in a proper bank, you know, in a proper location. And then someone's son needed a position, and I suddenly found myself thrown out the door. But that's how it goes sometimes." "My clientele is interesting, to say the least. Don't worry though, I'll make sure no mud or blood gets on your items." "Yes, yes, your goods will be perfectly safe. I personally guarantee it." This page was last modified on 12 February 2019, at 00:54.